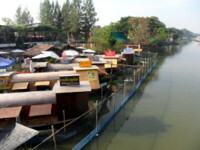 Bang Namphueng floating market in Phra Pradaeng district, Samut Prakarn is another floating market that’s authentically Thai, just south of Bangkok, a green and pleasant getaway from the city. 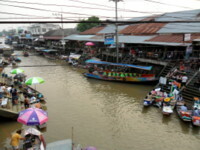 The floating market is located in sub-district Bang Namphueng, Phra Pradaeng district, Samut Prakarn province in a strip of land within the horse shoe meander of the Chao Phraya. 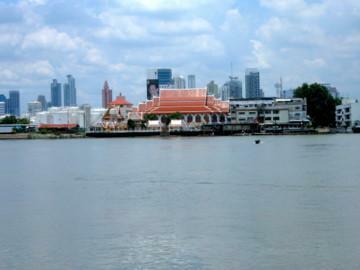 Bang Namphueng or Honey Village is just across the Chao Phraya River from Rama III Road, Bangkok. 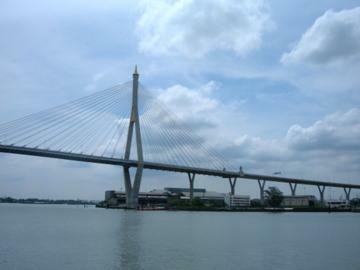 Near the Phra Pradaeng town centre, the spectacular Industrial Ring Road suspension bridges cut across the base of the meander and span the Chao Phraya twice. 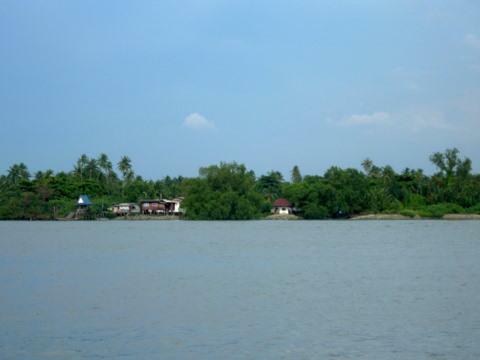 The Phra Pradaeng peninsula within the river meander, 5 km long and 4 km wide at its widest, is hemmed in on three sides by the Chao Phraya. The base of this peninsula, its only land link, is almost being worn down by decades of erosion as if it’s being nipped by giant fingers aiming to turn Phra Pradaeng into an island in the river. 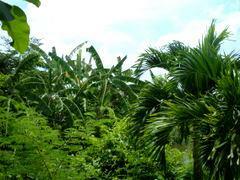 Phra Pradaeng is noted for its greenery and is often called the green lung of Bangkok. 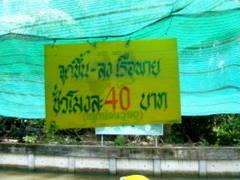 This photo taken at the mouth of the Chong Nonsi canal in Rama III Road, Bangkok speaks for itself. 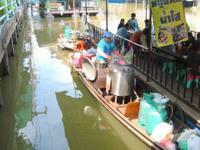 The Bang Namphueng floating market is set is such an environment. 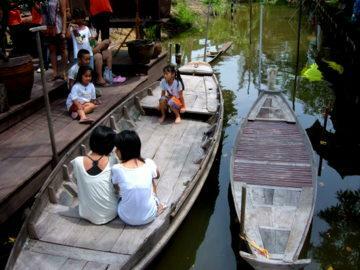 This was the first scene that I encountered on arrival at the floating market. 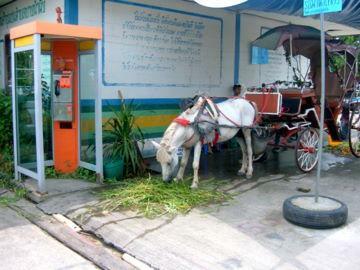 I thought that the only horse drawn carriages in Thailand are in the northern province of Lampang. 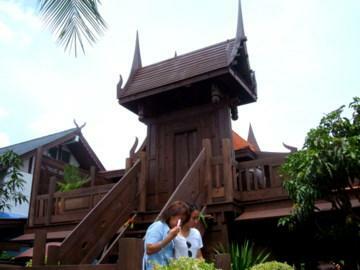 They got them in Phra Pradaeng too. 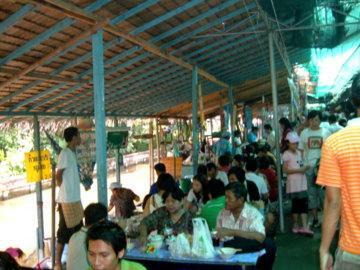 Compared to Taling Chan, the Bang Namphueng floating market is much bigger and more dispersed, with more shops, food stalls and dining areas. Just look at this. 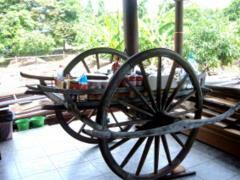 Served by numerous water borne kitchens. 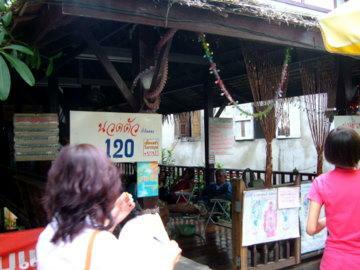 The canal is much narrower here and this traditional Thai house immediately caught my attention. 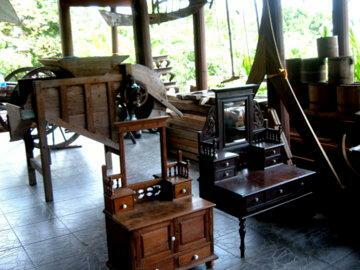 What’s more it’s a museum displaying vintage items. It’s also a pleasant place to relax. 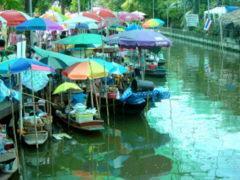 Bang Namphueng floating market is a very Thai and authentic floating market that’s not touristy. 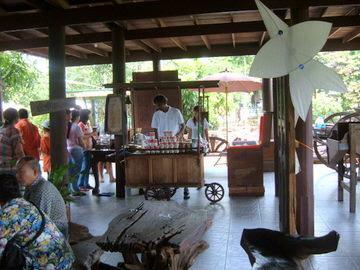 The kids will have a pleasant Sunday outing as well. 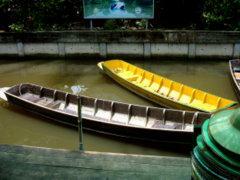 Or take a boat ride along the canal. 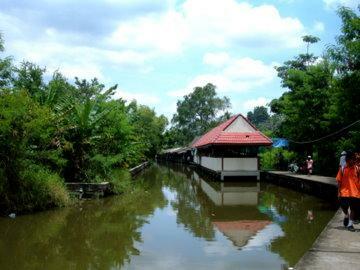 Note the surrounding vegetation from one end of the floating market. The canal leading away from the market heads east towards the Chao Phraya opposite Wat Bang Na Nok where there’s a ferry crossing. Then rest your tired feet in a very natural environment. Or if you prefer some help. The striking feature of this area is the greenery all around, no high rise buildings, just a few single or two story houses. 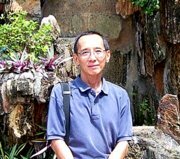 After the floating market tour, I decided to take a motorcycle taxi to the pier at the end of Ratrangsan Road and then a ferry back to Wat Khlong Toei Nok pier in Bangkok to view the countryside and also to find a less roundabout way to get there. On the way out I ran into a couple of horse drawn carriages taking visitors on a leisurely country tour. I wish I could have joined them. 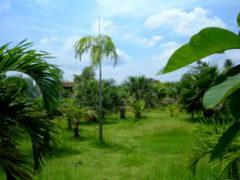 Ratrangsan is a narrow country lane flanked by plantations and natural greenery with the occasional house. Sorry I am unable to give your any photos of the view during the motorcycle trip. As I was hanging on to dear life, I couldn’t reach into my bag to get the camera out. Still I’m glad I came back this way. 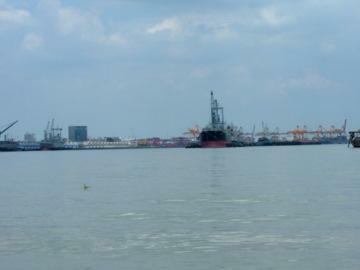 Otherwise I would have missed these contrasting scenes on the Chao Phraya; Khlong Toei the container port just north of Phra Pradaeng. The high rise luxury in Sathorn just 4 km further to the north seems like a world apart. That tall building in the centre of the photo is the 5 star Banyan Tree Hotel. 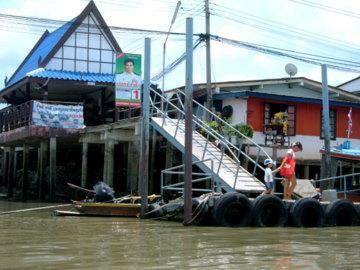 Back in the peaceful river houses in Phra Pradaeng, life goes on. 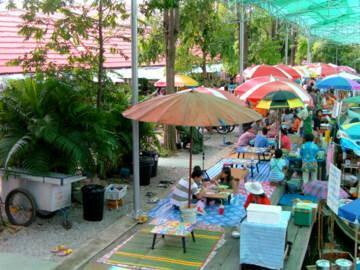 Bang Namphueng floating market gives the local residents an outlet to market their produce to people in the area and surrounding areas who flock to it every weekend. Local markets like these contribute to the internal economy so vital as a cushion against the fluctuations of international trade. 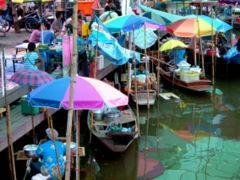 Aside from the economic benefits, this floating market in Phra Pradaeng is also a beautiful and healthy recreational outlet. 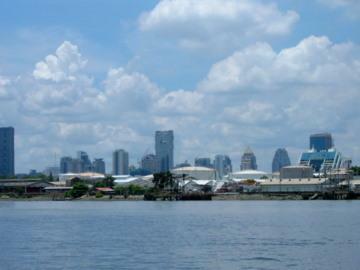 It’s so near Bangkok yet so different, pleasantly different. If it’s convenient for you to take a skytrain, go to the Wong Wian Yai terminal station. 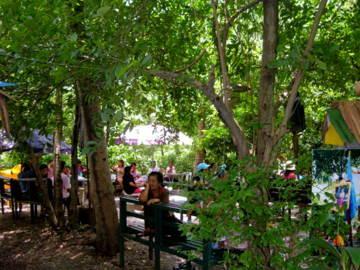 Get off and walk towards Somdet Phrachao Taksin Road. Turn left into this road and take the southbound bus no 82 to Phra Pradaeng. 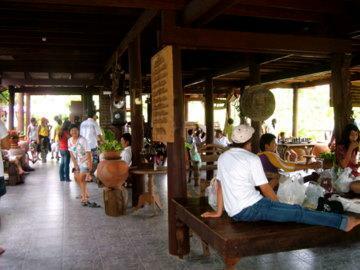 At Phra Daeng bus station take a taxi or song taeow (pickup) to the floating market. If you are in a group you can charter a taxi and get there via Rama III Road - Industrial Ring Road Bridges - Suksawat Road - Nakhon Khuean Khan Road - Phetchahueang Road. 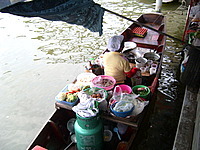 The most direct and fastest way to get there from Bangkok is actually the way I got back. 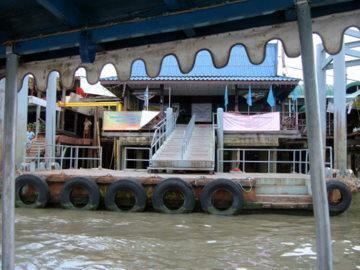 Go to Wat Khlong Toei Nok pier, take a ferry across for 5 baht then take a motorcycle taxi from Chaeng pier to the market for 30 baht. However this isn’t recommended for groups and families. The market is open every weekend from 8 am till I am told now 3 or 4 pm instead of 2 pm. Anyway get there by late morning and you’ll be OK. Have a nice trip. 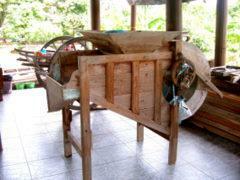 To return to Bangkok communities.